The strike is over. City workers came out with a 5% raise, but it didn't even match this year's 6% cost of living increase. The unions refused to negotiate on anything but wages even though workers also need better working conditions. The workers voted for a 10% raise, while Civil Service asked the Board of Supervisors for only 7 1/2% (knowing full well that when you bargain you get less than you ask for). The Board of Supervisors came back with an outrageous counter-offer which eliminated automatic annual raises that had been in effect since 1943. Then Alioto and the union leaders announced that the strike was over before union members had even voted their approval. It almost looked pre-planned. 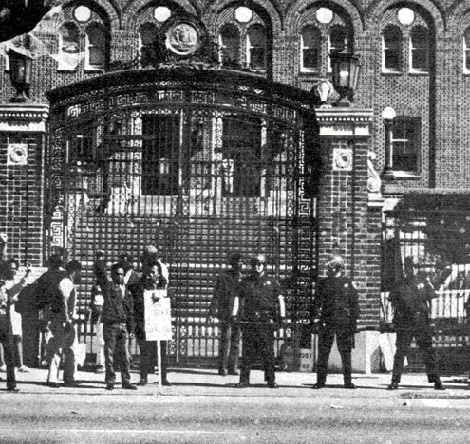 The strike at San Francisco General Hospital had been coming for a long time. Doctors were unhappy at the poor quality of medical care. Workers were dissatisfied with working conditions and wages. And patients were tired of inadequate medical care. Los Siete de la Raza supported the strike because many people in the Mission and in the other low income areas in San Francisco must depend on the hospital and its clinics and its emergency room. It is the patients who suffer when a hospital is understaffed, overworked, underpaid and putting up with poor working conditions. And many of the hospital workers are the same people who live in the Mission and the Fillmore and the other so-called low income areas that Los Siete de la Raza seeks to serve. They are caught in the squeeze between inflation, higher taxes and fewer jobs. WHAT WAS THE STRIKE ABOUT? What was the strike about? The unions were negotiating for wages. The cost of living went up by 6% last year, but for many people in San Francisco, it went up more. Food prices go up every week. Clothing has gone up. Hardware has gone up in price and down in quality. Cars cost more to run and bus fares went up. Rents have skyrocketed. Two years ago it was nearly impossible to find an apartment for less than $110. Now you can't get anything for less than $140. Property taxes have practically doubled in many cases. Wages are only part of the problem. Benefits for city workers are less than for private industry. Workers who want can join a health plan (most belong to Kaiser) but they pay extra. The city only picks up 34% of that cost. For their pension plan workers put in $1 for every $2 the city pays. This means take-home pay is considerably less. There's no dental care, no day care for working parents. The cafeteria food leaves much to be desired. Theres no on-the-job training. People must make real sacrifices to go back to school to gain the knowledge for schools that pay more. Meanwhile the hospital doesn't have enough technicians. The hospital discourages criticism. Before the strike, people actively campaigning to improve conditions had to work in secret so they wouldn't lose their jobs. Even union stewards were in danger of losing their jobs for trying to help their fellow workers. Most departments are understaffed, so everyone has to work that much harder. Meanwhile its impossible to give patients good care. There are about 350 temporary workers at S. F. General. They receive much lower wages ($300-400 a month) and no benefits. Although they are supposed to become permanent after 90 days trial, many of them wait for years before they can become permanent and start receiving union wages. Take the laundry. People there usually have to work 2 or 3 years before the hospital allows them to join the union. I talked to a lady clerk. She had been getting $300 a month since she started working 6 months ago. Her last paycheck was for $250. When she asked why she was told that she was only temporary and that they could be paid anything. (If much of that goes on, no wonder so many clerks are rude to patients!) Not only that, they can be fired with no more than five minutes notice. The union leadership is doing a bare minimum during this strike. They did nothing to press for meaningful changes. They only talked wages. They could have demanded that people aren't kept temporary for years. They could have backed the interns demands for more personnel and better social services and on-the-job training and neighborhood clinics. They could have demanded automatic cost-of-living increases. Union members approved these things, but the unions didnt want to help. The workers voted for a 10% raise, but the Civil Service only asked for 7% when they went to the Board of Supervisors. The government of San Francisco as usual showed little responsibility to its ordinary people. Take the first raise offer. They didn't make a straight 5% offer. They offered some workers -- the jobs with more status -- 7%, while some maintenance workers were offered only 2%. Doctors, who already make around $20,000, were given raises amounting to thousands with hardly an argument. The interns raise was granted. This is an old game called divide and conquer. The object is to cause dissatisfaction and infighting. The interns won some demands, but may find themselves deceived. They got their patients drug and X-ray money restored. They got the triage (a doctor who sorts out patients as they come in to see who needs what kind of attention) in the emergency room; translators and round the clock pharmacy hours and social workers. None of these things have much to do with money -- they are better use of manpower. They will serve the needs of patients rather than the convenience of administrators and doctors. The interns got their salaries raised, which was only fair since they are expected to work about 100 hours a week, which (at about $6,000 a year) means they were getting about $1.10 an hour -- undoubtedly the City's lowest wage. WHO DOES THE CITY SERVE? The government of San Francisco makes a lot of noise about how it hates to spend the taxpayers' money, but it finds all kinds of things to spend it on that don't serve peoples basic needs. The City casually hands over a million for artificial grass and for a sign in Candlestick Park, but balks at a raise for workers who are helping sick people. The City spends millions on clerks and uniforms and equipment to beef up a police department. The City is willing to sock the man on the street for millions for BART so that bankers and their secretaries can get to work a few minutes earlier. Those buildings downtown in the skyscraper area got their taxes reduced to the tune of millions two years ago when the Reagan administration [when he was Governor of California] changed the tax base rates while small homeowners taxes nearly doubled. The City did nothing to regain those lost millions. It doesn't tackle the rich and powerful. Ordinary people are already hurting from inflation. It's not fair for them to bear the burden of poorer services, lower wages, and fewer jobs, not when the downtown financial center is prospering and growing. 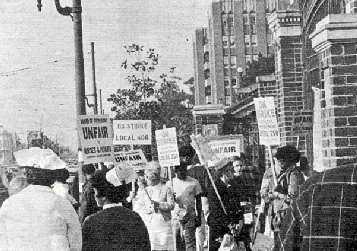 Striking general hospital workers picket during 1970 city workers strike.